One of the easiest ways to add pizzazz to your holiday decorating is with the use of string lights. Among the many opportunities that exist to decorate your interior spaces for Christmas, string lights are a quick and inexpensive way to set a mood and add visual appeal for the festive season. They can evoke a warm and comfortable “home for the holidays” feel, a jolly party atmosphere, or, even, a romantic softly-lit surrounding. String lights allow you to quickly transform a room’s mood by adjusting other lighting in a room. Wrap string lights around Christmas trees, garland, wreaths, or even other displayed greenery. Other ideas are to put string lights in or around table-top displays. A large hurricane sparkles with beauty when filled with string lights and glass ornaments. Fireplace mantels that are lit with string lights sparkle with festivity. If investing in new Christmas lighting this year, try energy-saving LED Christmas products. Green is in and the commitment will provide financial savings throughout the years. A variety of electric or battery powered LED Christmas products in many sizes exist to design a monochromatic white or colorful fascinating lighting display. The assortment of string lighting includes many bulb size options and shapes, as well as string lengths. Some popular shaped string LED Christmas lighting includes star-shaped spheres and Moravian stars to make a dramatic display. In addition to string lights, you can use rope or icicle lighting to embellish your environment. Pre-lit LED Christmas trees, wreaths, garland, or swags provide an easy and quick decorating option. 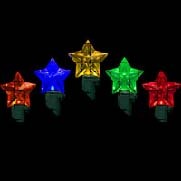 As with indoor LED Christmas lighting, many options are available for your outdoor yard decorations. What better way is there to improve curb appeal during the holiday season than with the use of outdoor Christmas lights? 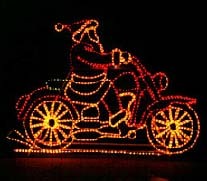 Whether using traditional displays like a nativity scene or using a more humorous non-traditional Santa riding a motorcycle, many messages of holiday reflection or cheer can be displayed in the yard. Outdoor Christmas lights can be used as accents for a home and its landscaping. Icicle lighting can highlight roof lines, while net lighting draws attention to shrubbery. Rope lighting can even be used to outline driveways and sidewalks to welcome visitors. Don’t forget to dangle stars and snowflakes from your trees. Neighbors can create a unified cohesive neighborhood look by decorating all parkway tree trunks and tree tops in same-colored outdoor Christmas lights. This creates a beautiful pathway down a street. The opportunities for creativity and cheer are endless with the use of outdoor Christmas lights.